Mr Rooter Tip Of The Day: Shower bodies can come with either male or female threads. Avoid copper sweat fittings at all costs. Whenever you work with a paste pipe compound, have a roll of paper towels around to constantly clean your hands. Otherwise you will get the stuff on your clothes and ruin them. According to Pittsburgh’s trusted plumber Mr Rooter, a single-handled shower faucet will typically need a very large hole cut for it, and to cut it, the homeowner will need a large-diameter hole saw (preferred), a jigsaw, or reciprocating saw. Bob Beall, master plumber and owner of Mr Rooter Plumbing Pittsburgh, says, “If hanging a shower surround, cut the hole in the finish surround and set it aside. If installing tile, mount the faucet body first, then cut the hole in the finished wall.” According to Beall, either measure the diameter of the faucet body or use a template, if supplied by the manufacturer. Tip #1 Using the manufacturer’s spec sheet, locate and mark the exact center of the faucet on the finished wall surface, typically in line with the drain and shower head and about 40-inches above the shower floor. Remove any stud behind this location and reinstall it where it won’t be in the way. Tip #2 Cut the hole and dry-fit the escutcheon plate to test its fit. Tip #3 Enlarge the hole with a rasp if necessary, then set the wall panel aside. Note how your faucet is configured for mounting, this varies considerably among models. Some faucets come with their own mounting brackets. Tip #4 It may be necessary to create a unique mounting system by gluing boards around the open hole to secure the pipe, which in turn secures the faucet. 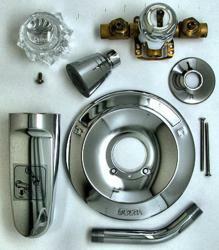 Assemble the water lines to the faucet body, install the necessary framing, and mount the faucet body. Tip #5 Mount the escutcheon over the faucet body with the supplied screws, making sure that the embossed designations for hot and cold water are in their proper places. Tip #6 Attach the handle with the supplied screw. Turn the handle to make sure it operates smoothly, then hook up the water lines. TRADE SECRET: Whenever you work with a paste pipe compound, have a roll of paper towels around to constantly clean your hands. Otherwise you will get the stuff on your clothes and ruin them. BONUS TIP: Shower bodies can come with either male or female threads. Avoid copper sweat fittings at all costs. Sweating copper can often destroy something on the inside of the faucet. Instead, look for thick solid-metal handles held on the faucet with a Phillips screw passing through the center of the handle into the center of the stem. Avoid handles with Allen-head screws threaded in their sides. When you have to remove the handle, you won’t remember what size tool to use and whether it was metric or not. There will always be a Phillips-head screwdriver around. Even if you do remember, odds are you’ll strip the screw and will have to break the handle to get it off. Sign up for Mr Rooter Tip Of The Day and automatically enter to win a pair of Steeler tickets to the Steelers vs Ravens home game at Heinz Field on November 18, 2012, and a gift certificate for the Tilted Kilt in downtown Pittsburgh.